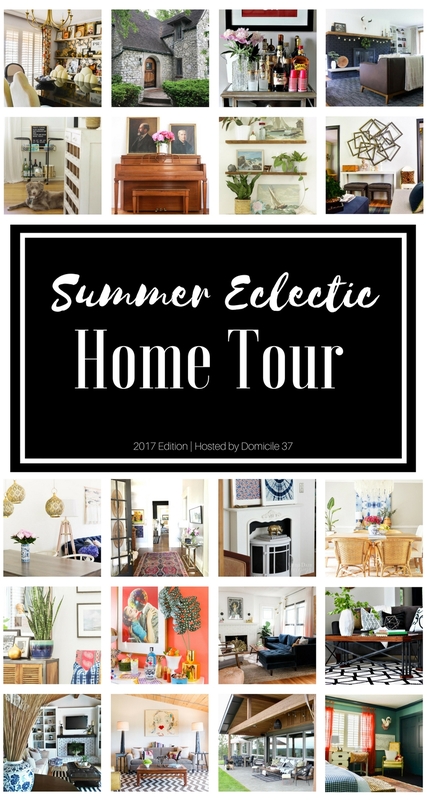 I'm joining a group of interior stylists and bloggers this week on a Summer Eclectic Home Tour hosted by Jess of Domicile 37! Warmest welcome if you are stopping by from This Is Our Bliss! If this is your first visit here, welcome to our home, a 60+ year old fixer upper that we have been renovating for the past four years and counting. I don't really do any seasonal decorating per se aside from the holidays, but I do make minor decor tweaks between the cooler fall/winter and warmer spring/summer months. 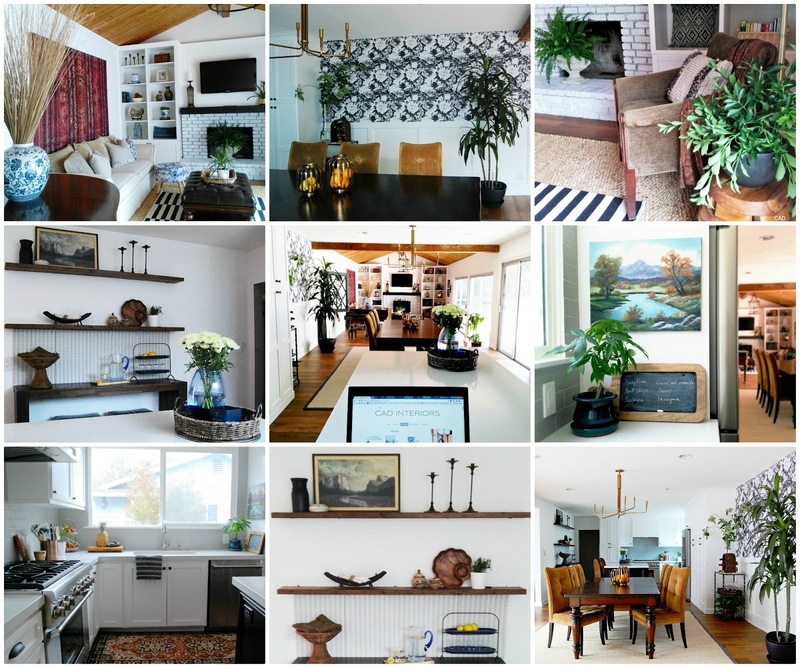 Right now, the house has an "earthy eclectic" summer vibe, with lots of natural textures and fresh greenery. I pulled together on-hand decor that fell within a white/cream, blue, and black color pallet to style the family room. Our summer home refresh was all about using what we already have, especially since we just spruced up this bedroom. Since the color scheme is relatively neutral (except for the wall tapestry), I mixed various patterns - stripes, ikats, abstracts, and geometrics - to keep things eclectically interesting! Plants are a favorite year-round accessory despite having a black thumb so you'll find them scattered throughout our home. I love the organic living element they add in a space, plus the splash of "green" is always welcome! The fern is still going strong under my watch, although it's only been a couple months since I bought it. 😉 I also clipped several branches from the yard to "assemble" the plant in the vignette above. 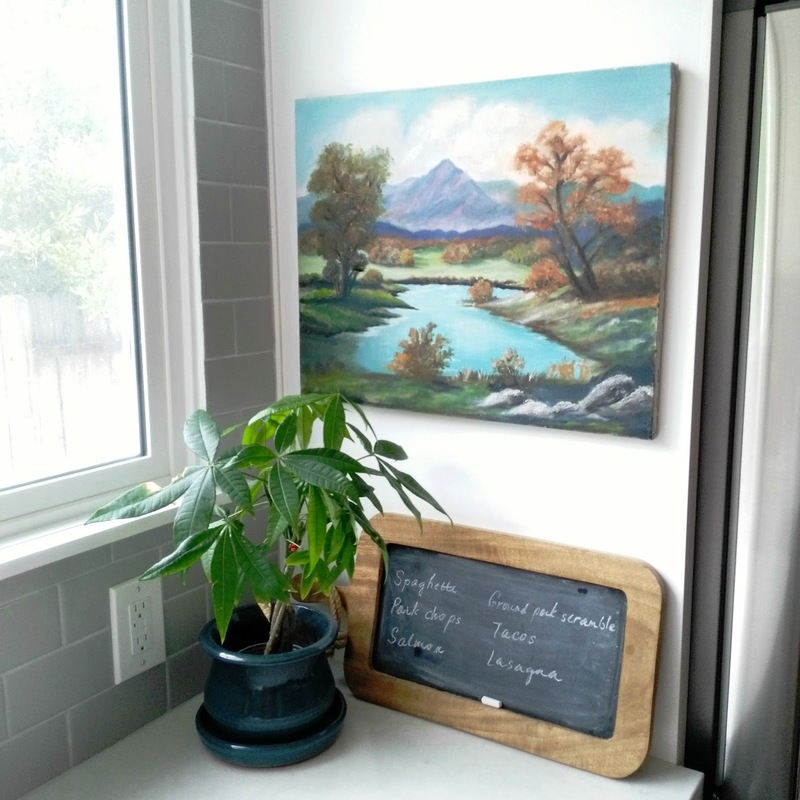 In the kitchen, I hung a vintage painting with a pretty landscape subject. The blues, greens, and browns feel so serene. It was a recent thrift store find for $10.00! I have been drawn towards vintage seascapes and landscapes lately. 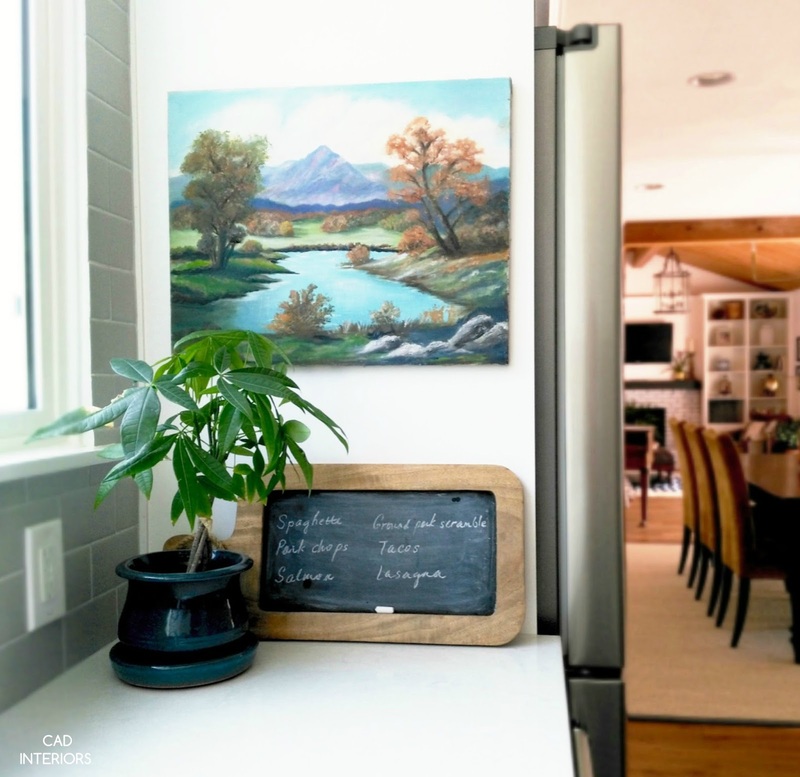 I usually jot down our weekly dinner menu on the chalkboard, which helps me plan the grocery shopping for the week. It also helps alleviate the inevitable "what's for dinner" question. 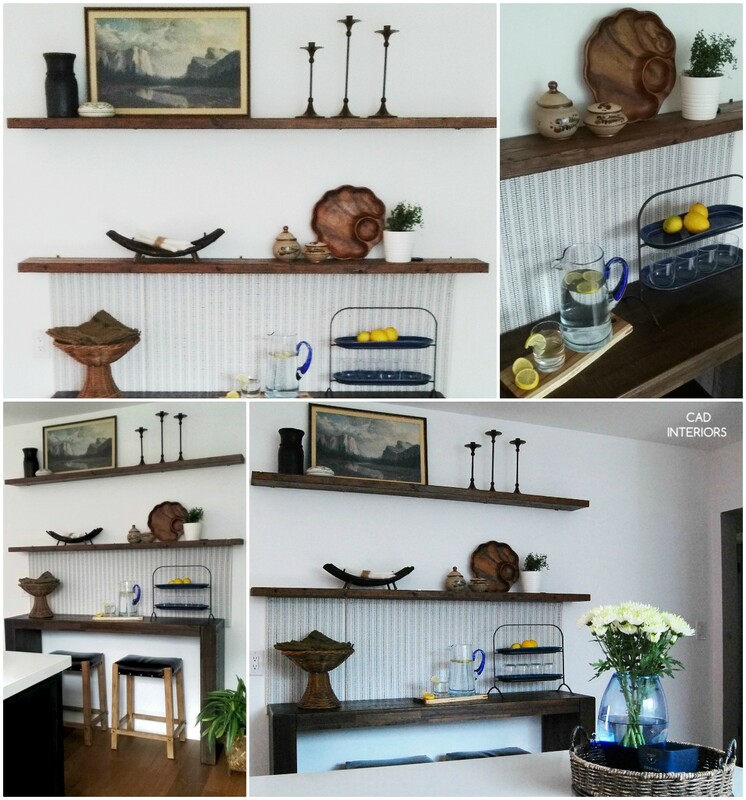 The shelves were styled with some treasures from our travels, as well as a vintage painting that was especially meaningful to my husband. 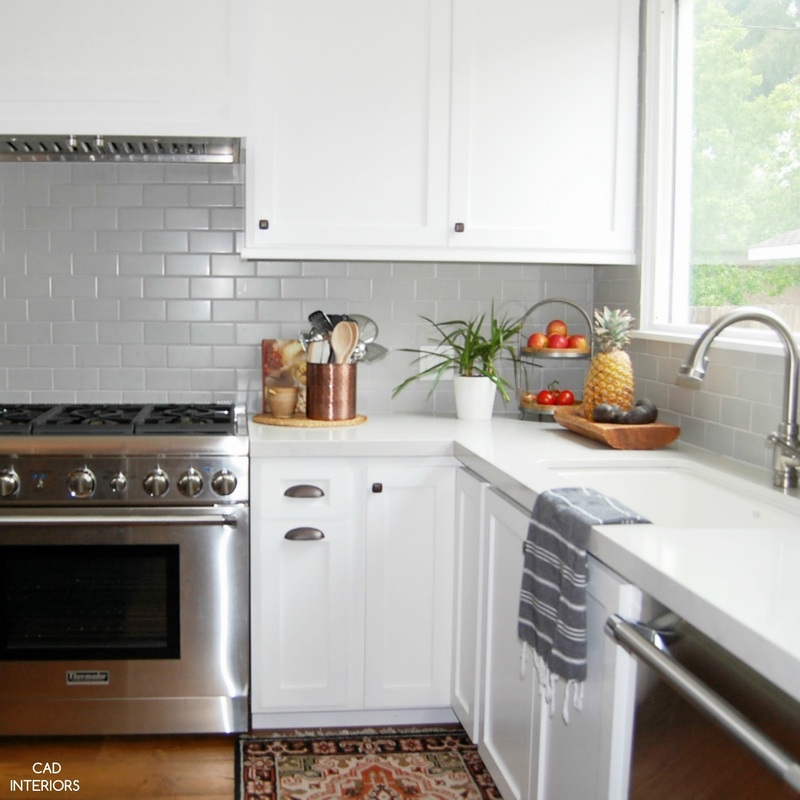 The woven and wood accents also add an organic and textural element to the kitchen. Our dining area, which is located between the family room and kitchen, is small but packs the biggest punch within the entire great room! 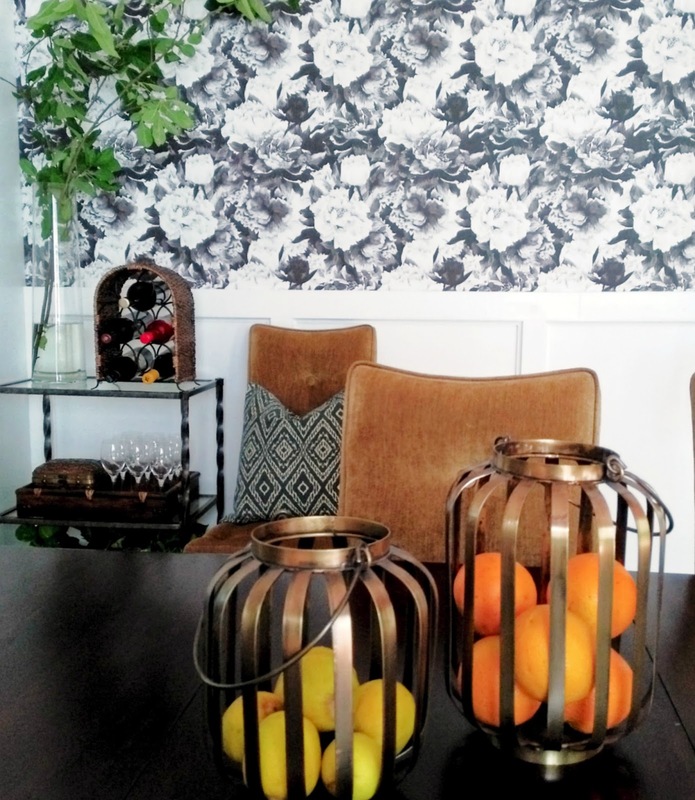 The wallpapered focal wall makes an eye-catching graphic statement, so I let it shine by keeping the rest of the dining room decor rather simple. 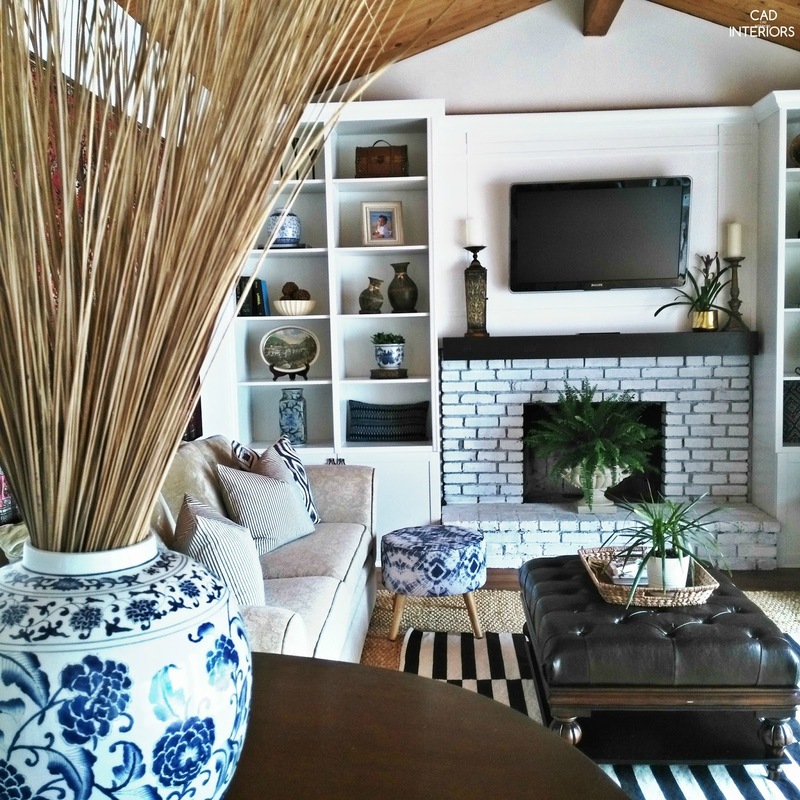 Thank you so much for stopping by our "earthy eclectic" great room! Next up on the summer tour blog hop is French & French Interiors. 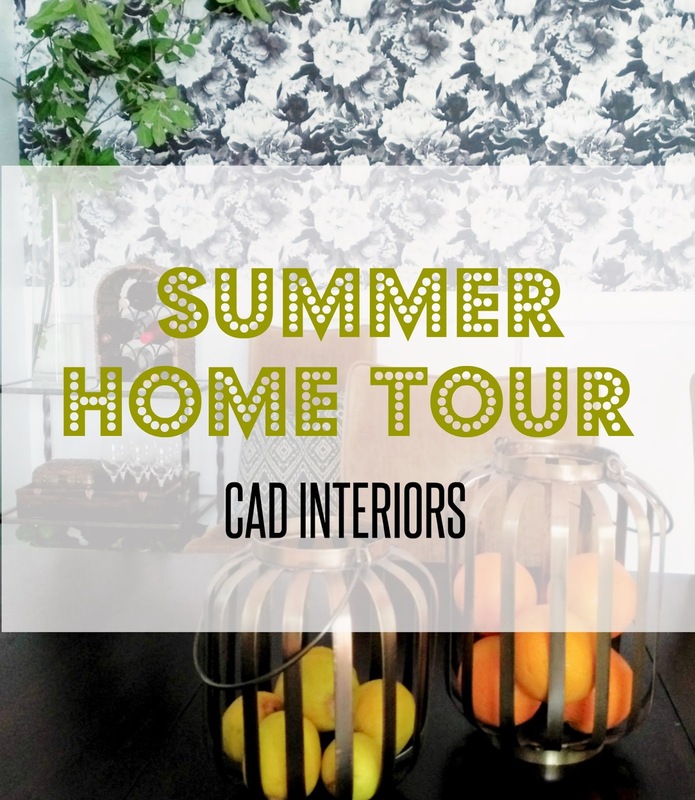 You can find the entire list of eclectic summer home tours below. There is SO much unique inspiration in this talented group, so please pay each one a visit! 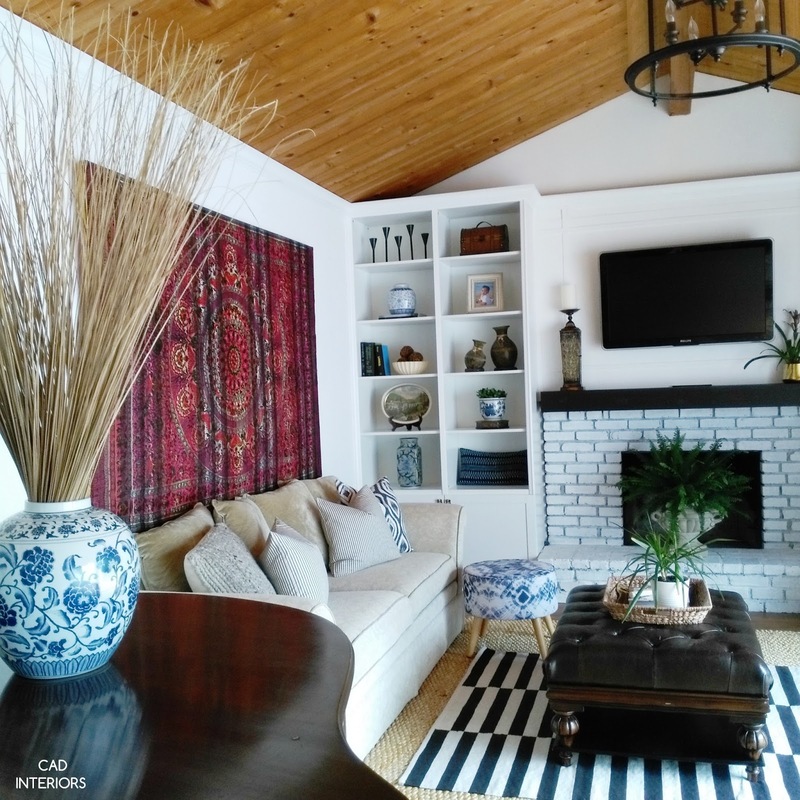 i love all of your living room pattern mixing and that showstopping tapestry on the wall! 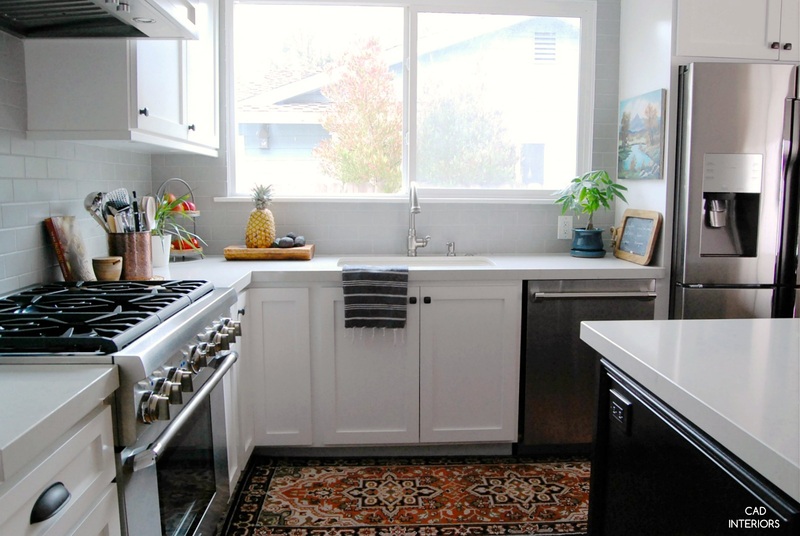 your home is eclectic and fun, but feels grown-up, too, if that makes sense. :) beautiful as always, carol! Carol, your home is just gorgeous. I love all the patterns and layers you have going on, and all the plants of course. And that wallpaper in your dining room is amazing! I always love to see your beautiful kitchen and now that new wall installation makes it even more gorgeous! Your dining room and great room are so cozy and warmly layered for a comfortable, yet very elegant vibe. Great job girl, love your style! Carol, you know I love you! Your style is so calm and put together and whenever I come to your site I always think, why didn't I think of that? I love how you mix color and your eyes are always so fresh when it comes to certain design perspectives. You always seem to amaze me. Thanks girl! Your home is quintessentially eclectic and I love very bit of it!! 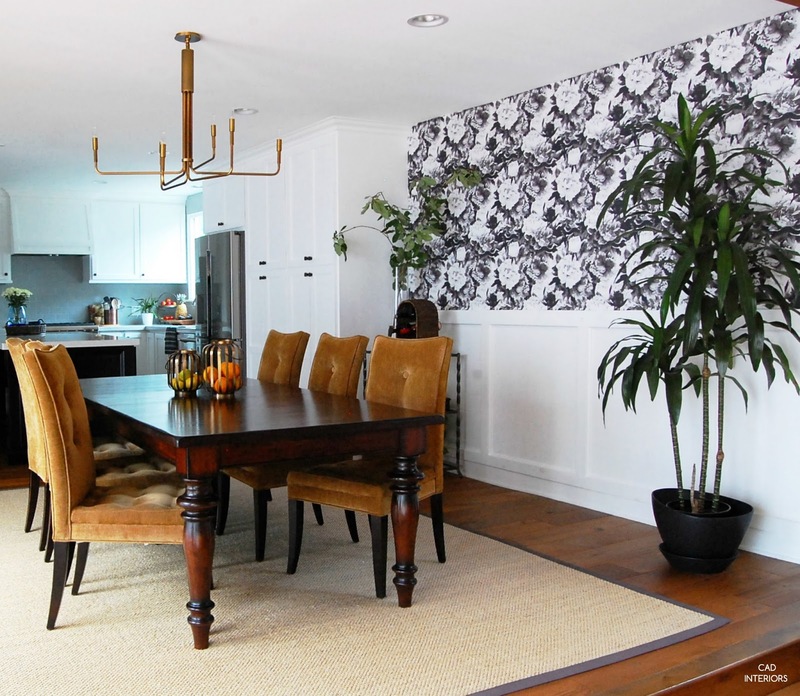 I'm totally smitten for the dining room light fixture (so drool worthy) and wallpaper combo. Your home is just lovely, Carol!! You must tell me where you found that blue and white footstool in the living room- I'm obsessed! And your wallpaper, chandelier, tufted chair combo in the dining room is seriously gorgeous- it has an understated, elegantly glamorous feel. Beautiful house Carol! Thank you so much for all the kind words, Diane! Lol - The footstool was an online clearance Target find from a few years ago! It's funny though because I've never seen another one like it... :) So glad to "meet" you on this tour... I'm looking forward to following all your projects going forward! Your home is so fun, filled with wonderful pieces. Your new shelves on the kitchen are so cute, but my favorite is your living and dining room. The wallpaper and the plants are gorgeous. Thank you, Mila! The wallpaper decision was a little nerve-wrecking, but I am so glad I took the design risk and pushed myself out of my comfort zone! 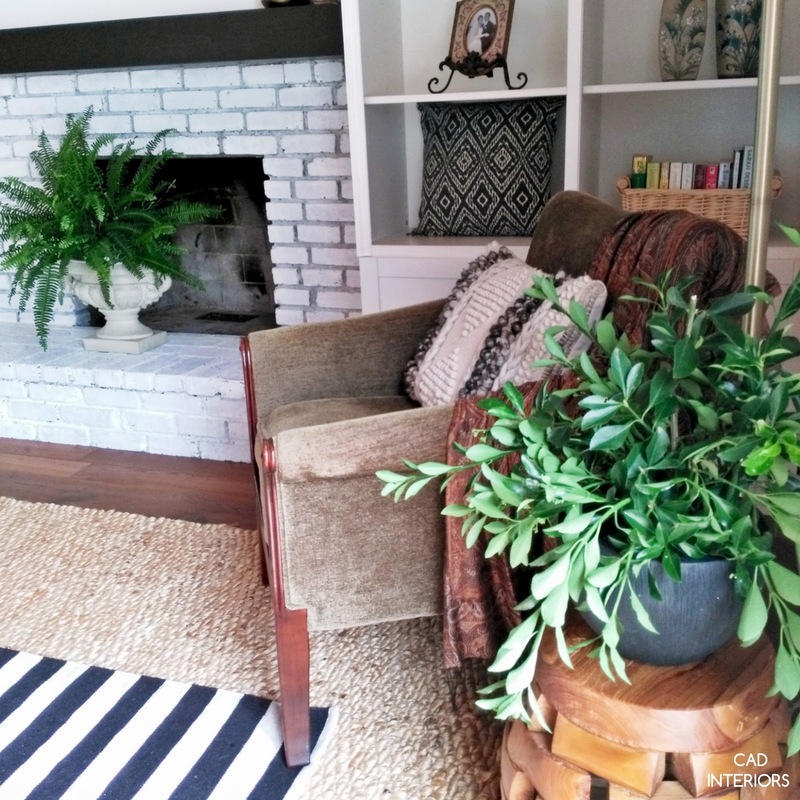 There is just something about plants that make rooms come "alive", right?! The fresh greens look so lush and really pop against your gorgeous white. And that chandelier is SO awesome! I totally agree with the earthy, eclectic summer vibe! Beautiful tour, Carol!! Thank you so much, Rachael! 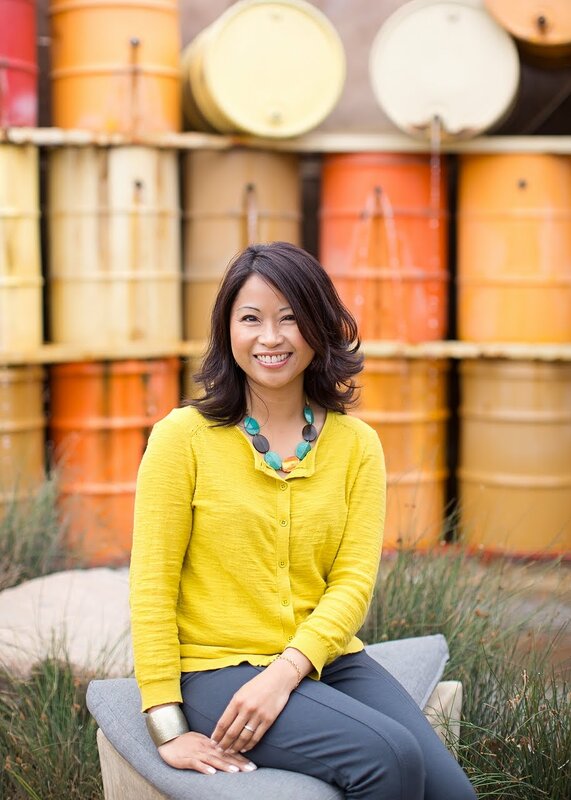 I think I'm a neutral at heart, but my eclectic side loves bold, fun pops of color and pattern. The chandelier casts such a soft and warm glow at night... we love it! I really love the plants in your pretty home. That chandy in the dining room is AMAZING and those shelves look beautiful. Lovely tour! Thank you so much! 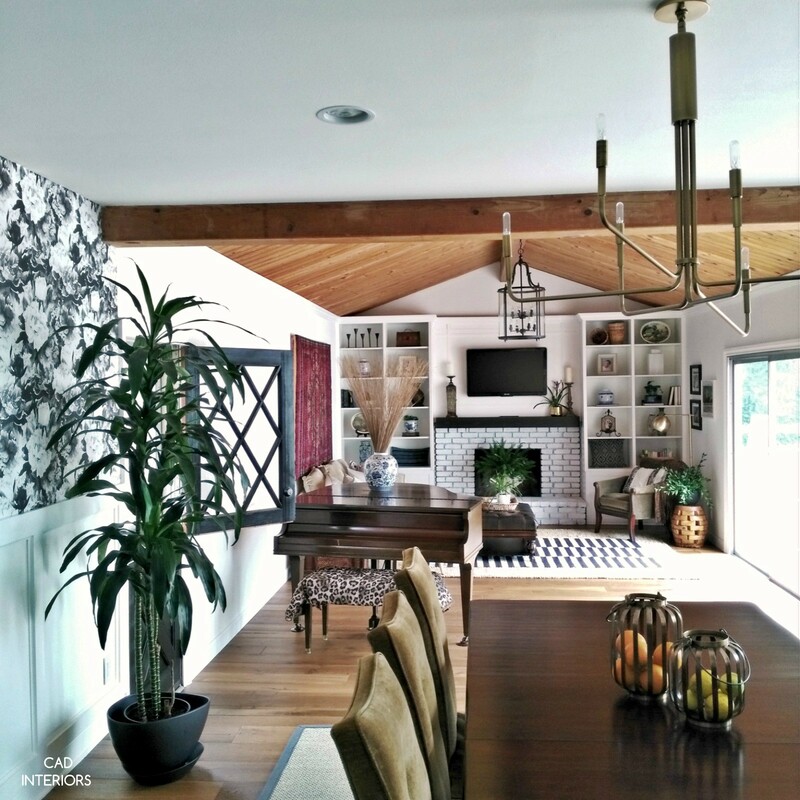 I was immediately drawn to the simple yet striking MCM shape of the brass chandelier, so I'm glad we were able to incorporate it during the makeover. We do love it! I wouldn't mind composing a post or elaborating on many of the subjects you write with regards to here. You have such an interesting home Carol, it's a feast for the eyes! I'm still in love with that dining room wallpaper, it is just perfect in there to define that space!! Enjoy your summer with your boys home!